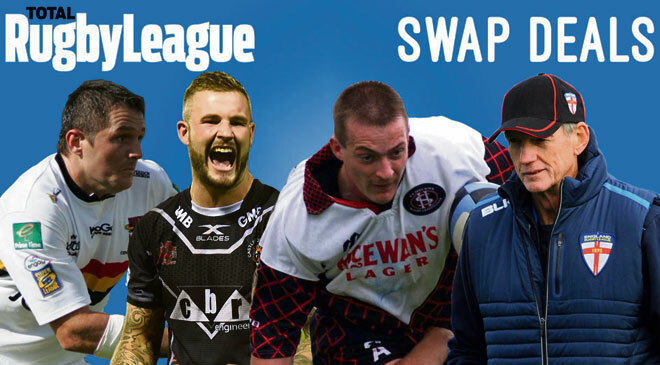 With the impending swap deal between Huddersfield Giants and Castleford Tigers for Joe Wardle and Sebastine Ikahihifo, Total RL takes a look at ten more swap deals in Rugby League. Not a common sight in history, but in recent years there has been a surge in the swap deal, but who got the better half of these trade-offs? When Joe Greenwood was vying for an NRL move, in hot form and earning a place in the 31-strong Elite Training squad ahead of the 2017 World Cup, St Helens opted for a straight swap deal with Gold Coast Titans for Zeb Taia. Former Catalans Dragons back-rower and 2016 Super League Dream Team member Taia quickly slotted into a Saints side with plenty of flair, while Greenwood eventually found life in the NRL difficult after an initial breakthrough start, moving back to UK shores with Wigan Warriors mid-way through the 2018 season. A bizarre move, and the most recent on the list, but South Sydney Rabbitohs and Brisbane Broncos swapped coaches this year. 2018 Dally M Coach of the Year Anthony Seibold, who also coached South Wales Scorpions, traded club jobs with England coach Wayne Bennett, with the move initially intended to take place ahead of the 2020 season. But Bennett was later sacked by the Broncos after discussions to bring forward to the move a year were halted, but the switch took place earlier this week despite the 68-year-old’s best efforts. These two have certainly had hugely contrasting careers trajectories since their 2015 swap deal between Castleford and Wakefield. Since his move to the Tigers, Paul McShane has become one of the most consistent hookers in Super League, while Scott Moore finds himself recently back into the sport with Rochdale Hornets after he was jailed for 23 months in March after driving a car at 150mph in a police chase, before being granted an early release. Paul Newlove was one of the hottest prospects in Rugby League when a 22-year-old in blistering form cost Bradford a world record £245,000 from Featherstone Rovers, but he left two years later in acrimonious circumstances. St Helens forged together a £500,000 package that included three Great Britain internationals in Sonny Nickle, Paul Loughlin and Bernard Dwyer to convince Newlove to join, as the Bulls began to piece together a top side in a new wave for the club, as Newlove enjoyed eight successful years with Saints. Troubled Leeds Rhinos fullback and former Man of Steel Zak Hardaker was on the lookout for a fresh start when he requested a move to the NRL for the remainder of the 2016 season. Penrith took on the England star on loan, with James Segeyaro moving in the opposite direction in a two-year contract. The move, sadly, worked well for neither party despite a lot of early promise. Segeyaro took to Super League incredibly well, scoring 6 tries in ten games, before turning his back on his contract and citing homesickness to return to Cronulla Sharks, before being released at the end of last season. Hardaker never truly took to life in Australia, scoring a solitary try in 11 games, before joining Castleford in a £150,000 deal and returning to his blistering form. In the run-up to the 2017 Grand Final, however, his contract was terminated by Castleford on 21 February 2018 following his suspension in September 2017 for drug offences. Wigan Warriors eventually snapped up Hardaker upon his return to suspension on a four-year contract, with the 27-year-old once again having a point to prove. Typical for the list, but again another bizarre situation. A swap deal where both players are returning to the clubs they signed from. Brough joined Huddersfield Giants in 2010 from Wakefield, while former teammate Grix returned to Wakefield in 2017 from the Giants. To confuse matters even more, prior to his spell with the Giants, Grix had been at Wakefield for another two years – meaning the 34-year-old will begin his third spell with the club in 2019. Brough and Grix have both been integral to both Trinity’s and the Giant’s line-ups in recent seasons, and despite approaching the back end of their careers, there’s no reason the two cannot continue that trend next season. In a remarkable exchange between two of Super League’s big hitters, Bradford Bulls purchased Mickey Higham for £70,000 from St Helens, before immediately swapping him for Wigan’s Terry Newton. Mickey Higham went onto to enjoy a fruitful spell with Warrington Wolves, winning three Challenge Cup and appearing in two Grand Finals, after staying with Wigan for just two years. Newton’s personal life eventually took over from a successful Rugby League career that was beginning to reach its peak, and in 2010 while at Wakefield he he was given a two-year ban after being one of the first sportsmen to have tested positive for human growth hormone, before sadly being found hanged in his home seven months later. In the most bizarre swap in Rugby League of all time and, trust us, this one comes into the category of quirk, but where Rugby League goes – as this list proves – quirk follows. Oldham sold Jeff Edwards to Rochdale for £1,000 and four turnstiles in 1989, with both clubs in not the most healthiest financial climates. Salford Red Devils and Castleford Tigers were involved in a swap deal in 2013 that involved Ryan Boyle returning to West Yorkshire for a second spell with the Tigers, with Jake Emmitt moving in the opposite direction. Boyle lasted another three years as a squad player with the club, before eventually leaving for Halifax in 2017, where he had initially played on loan. He now founds himself in League 1 with Richard Horne’s Doncaster, while Emitt’s career has taken a far more diverse path. The Warrington-born forward played for Leigh and Swinton in the Championship, before rejoining former Centurions coach Paul Rowley at Toronto Wolfpack in 2o17.